The TDM-based, FCC-compliant AirMux-104 wireless multiplexer operates in the 5.725–5.825 GHz spectrum, which many countries are opening up to license-free transmissions due to the overcrowding and resulting interference in the 2.4 GHz license-free band. License-exempt links allow for faster and more affordable deployment, since no frequency coordination and license fees are required. AirMux-104 integrates voice and data, E1/fractional E1 and Ethernet/IP traffic over a 2.6 Mbps full duplex wireless link, extending data and voice transmissions up to 16 km (10 miles). It is a perfect solution for point-to-point applications that call for rapid deployment or a temporary hookup, especially in areas where wireline links are expensive or infrastructure does not exist. The combination of LAN and E1/T1 interfaces of the AirMux saves the cost of an external multiplexer. The AirMux complements various RAD products to offer a complete solution. For example, the AirMux can provide license-free wireless connectivity between sites at which other RAD products perform applications such as grooming, voice and data multiplexing, PBX extension or voice compression. Integrating equipment from one vendor enhances reliability of the solution and provides a single point of contact for the entire network. A single network management system simplifies management of the equipment, especially in large networks. The ability of the AirMux-104 to transport both Ethernet/IP and TDM traffic over a wireless link makes it ideal for a variety of applications, including connectivity of LANs and PBXs at dispersed campus locations, wireless backhauling of cellular base stations, and the Wireless Local Loop (WLL). License-free fixed wireless is also commonly used for backup links and disaster recovery as well as for temporary sites such as army camps, construction sites and mines. AirMux implements time division duplex (TDD) technology, for 2-way transmission (transmit and receive) over the same frequency, for a total requirement of 10 MHz channel space. This lets AirMux provide 12 operating channels, facilitating easy selection of a free operating channel for simple installation, and enabling co-location of up to 12 devices at one location. Channels are selected in software only, through the integrated management system, eliminating the need to change hardware as required in other systems. 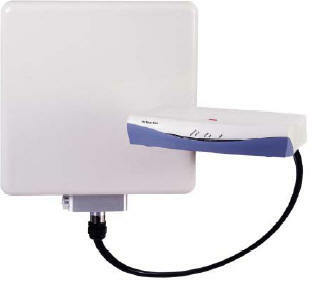 A different version of the device, the AirMux-106, operates on Band B (5.470–5.725 GHz), frequencies that are commonly reserved for license-free transmission in Western European countries. recommended to include it into technician kits.